Did Plato’s ideas anticipate Freud in any way? Plato also had ideas about emotions and emotional control that anticipated Freud’s theories of the ego and the id. Plato’s three-part division of the soul into appetite, reason, and temper (also known as the spirited part of the soul) has been linked to Freud’s division of the mind into the id, ego, and superego. Plato also believed in controlling the bodily passions in order to turn one’s desire toward loftier goals, as described in his metaphor of the soul as a charioteer with a pair of winged steeds. One steed is immortal like the steeds of the gods and aspires toward contemplation of spiritual beauty. The other steed is mortal and plunges toward earth and toward animalistic passions and desire. The chariot must rein in the steed of animal appetites in order for the soul to gain true happiness. We can link the earthly steed to the id and the charioteer to the ego. More loosely, we could tie the immortal steed to the superego. 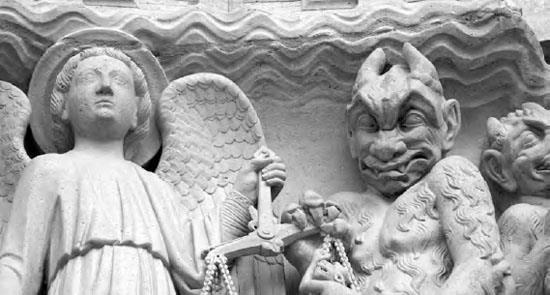 It was once common in Europe for people to believe that mental illnesses were the result of possession by devils and demons. In the Middle Ages, Satan was often blamed for most of the suffering in the world.